You mentioned in another thread (Oct 2010) that you might try to carry these snaps on your website. Still in the works? Any plans for them in the future? I would have expected Mark to at least respond to this by now. I can hardly believe he missed the post, but perhaps he's just too busy. First off, I refuse to pay $27 + approx $9 shipping for 12 of these snaps from Cabella's... no matter how good they're purported to be. So, in light of that, this is what I did... I ordered a few Berkeley #7's off ebay ($7.95 + free ship for 8 snaps)... at the same time, I ordered 100 #2's directly from Rosco ($25 + $6 shipping). 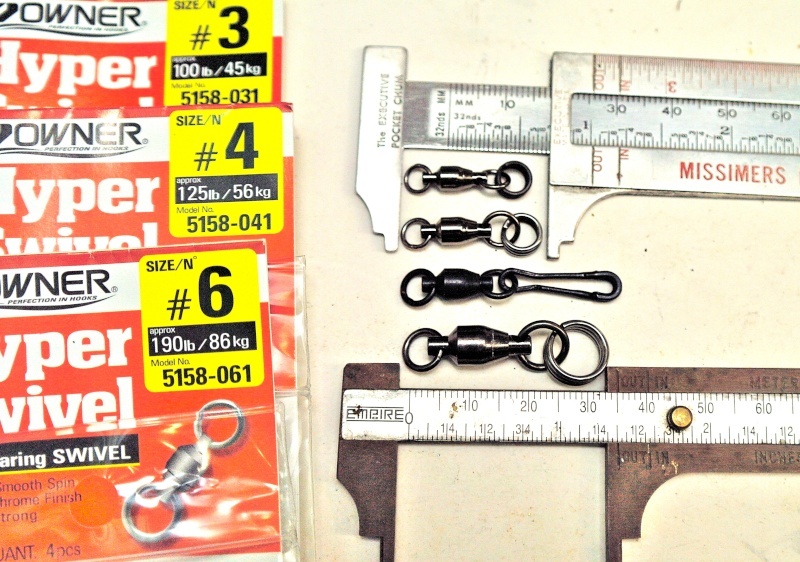 I compared the snaps and found that the #7 Berkleys are the same size and test (40lbs) as the Rosco #2's. Truthfully, the Rosco snaps looks to be manufactured better (the black finish is smoother). For all intents and purposes, they look to be exactly the same in form/function (and material), and for all I know, Rosco may be the actual manufacture for Berkley. Both don't come with a fancy ball bearing swivel however, but having fished all my life without them, I doubt it'll make too much difference if I just go with regular barrel swivels. By the way, Rosco must understand that the smaller sized snaps are not readily available on the internet or at retail locations. They had no problem selling 100 of the #2's to me. Now whether $31 for 100 snaps is a good deal, I really don't know. They did ship very quickly, and were very courteous so I feel I got a good deal... especially considering I couldn't find them anywhere else. You do have to order over the phone though. In any case, I just wanted to pass this along to anyone interested. aloha all! my first post here, and hopefully it proves to still be useful for some. if anyone is still looking for mcmahon snaps on oahu, i happened across size #4 at nankos in kaneohe. still hoping for my first hookup w/ the .5oz plug, otherwise. Actually i using ball bearing swivels now not barrels.. I get better action with that..anyway i tried mac snaps and my b/b swivels tend to almost slide outta the snaps so thats why i dont use those no more.. In my favor split rings are best for my plugging style..
Subject: Re: Mcmahon snaps - availability? » Trish with Randy, Batista, and Jericho sigs.